Modern data centers have evolved into a complex web of virtual machines, clouds, and growing user expectations. 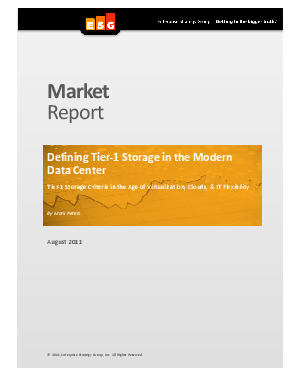 Gain a better understanding of the modern definition of "tier-1" storage according to ESG. Find out attributes and categorization required for your infrastructure to operate a modern data center. Be in the know about the appropriate criteria which will enable your "tier-1" storage to cope and respond to the needs of the "next-generation data center".